Individual tribal members have been encouraging and generous in sharing information and insights and in reading early drafts. Others have been frank in sharing reservations about an undertaking that fictionalises the life of a beloved figure and sets down an imagined version of that life that may be interpreted as factual. This afterword attempts to address those reservations somewhat by distinguishing scant fact from rampant invention. This concern – “an imagined version … that may be interpreted as factual” – should by now be familiar to readers of Whispering Gums. In fact, this book has several synchronicities with my recent and current reads. There must be something in the water! Firstly, the issue of fictionalising the life of a historical figure is something I have raised a few times, but most recently in my review of Tansley’s A break in the chain. And then there’s Scott’s That deadman dance which explores early contact in Australia between white settlers and indigenous people. Very different stories and yet several similar concerns and issues, such as those regarding land, education, and cultural attitudes to material possession and to hunting. And there’s more! My next review will probably be Leslie Cannold‘s The book of Rachael which is set in biblical times and features a fictional woman who loves learning and rebels against the strictures of her gender. I love it when my reading interacts closely like this, when books enable me to explore and play off ideas against each other – so I thought, given this and the fact that there are already many reviews out there, that I’d tease these out a little instead of my more usual review. But first a brief outline of the plot, which provides a mostly imagined backstory to the real Caleb Cheeshahteaumauk through the eyes (journals) of the fictional white girl/woman Bethia Mayfield. The book starts in 1660 when Bethia is 15 years old, but it quickly flashes back a few years to when she met Caleb while out clamming and it describes the friendship which developed between them, forged by a mutual interest in learning about each other’s culture. Idyllic really, but of course it doesn’t last. Caleb is noticed as a young man with the potential to achieve in the white world and comes to live with Bethia’s family, so he can be taught by her father. Eventually, Caleb and another indigenous student, Joel Iacoomis, go to school and then Harvard along with Bethia’s not particularly clever brother, Makepeace. By a cruel twist of fate, Bethia goes with them as an indentured servant. She’s not too disappointed about this because she hopes to surreptitiously acquire a bit of learning too. That’s the gist of the story … and if you know the history, you’ll also know roughly how it all ends, but I won’t spoil that here. You will pour across the land, and we will be smothered … We must find favor with your God, or die. And this brings me to the second synchronicity, that concerning early contact between white settlers and indigenous inhabitants. Brooks (a white Australian author based in the USA) and Kim Scott (a Noongar author from Western Australia) explore similar territory but from different points of view: hers is told in the voice of a white woman, and Scott’s has a more complex narrative voice but from an indigenous perspective. Both explore the complexity in motivations. In white society, we see the whole gamut from altruism through attempts to “get along”/cooperate to arrogance, cruelty and greed. And we see an equally complex response from the indigenous people, from Caleb’s “if you can’t beat ’em join ’em” to Tequamuck’s anger and aggression. The end result, as history shows us, is the same … and neither book (nor Grenville’s) is anything other than realistic about it. Finally, there’s the gender issue. This – like Grenville’s writing about colonial attitudes to indigenous people – is where writers are often criticised for being anachronistic, for putting modern attitudes into the mouths of historical people. It’s a criticism I tend not to share (providing the character is coherent within the text). “New” ideas do not pop out of nowhere. They grow and develop over time, and they grow from exceptional people – not necessarily well-known people, but people who thought ahead of their times – and novelists, almost by definition, tend to explore the “exceptional”. I have no problem believing that a “Bethia” or a “Rachael” lived in their times … just as I have no problem with what some critics have called Thornhill’s “anachronistic sensitivites” in The secret river. Enough rambling, back to the book! Did I enjoy it? Yes. Did I think it worked? Partly. Geraldine Brooks is a good storyteller and I read this book in quicksmart time. I was interested in the characters and I wanted to know what happened to them. 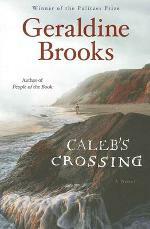 Brooks evokes the era well, using enough vocabulary and phrasing of the period to immerse you in the time and place. Her physical descriptions are beautiful. You know exactly why Bethia would prefer her island home to the streets of Cambridge. The themes – colonial cross-cultural conflict, gender roles, coping with loss – are valid and clear. And her wide cast of characters realistically cover the gamut of attitudes you’d expect. And yet, I’m not sure she quite pulls it off. My concern is not so much with her vision, with the ideas she puts in the mouths of her characters, but with her mode of telling. She is rather heavy-handed with the foreshadowing. It’s a valid technique given the story is told in retrospect but it feels overused, which somewhat devalues its dramatic impact. I also wonder whether telling Caleb’s story through Bethia’s eyes means we don’t get to know Caleb well enough, resulting in our not being as emotionally engaged with him as we could be. There are hints of sexual tension between Bethia and Caleb but they are never played out. Perhaps doing so would have turned it to melodrama and yet, once hinted, it needed some resolution. I tend to like first person stories and the immediacy they provide, but maybe a different narrative voice (even multiple points of view) would have been better here. this truth my mother had voiced … that it could not go on, this crossing out of one world and into another. If I had turned away from that boy … and ridden back to my own world and left him in peace with his gods and his spirits, would it have been better? Would it? Now there’s the million dollar question! Hmm… I’m not quite sure whether to fit reading this into my schedule now. Sometimes I worry that Geraldine Brooks is a bit like Isabel Allende, in the sense that its the early works I really enjoy? I’m not sure the difference is as great because all of Brooks’ books are historical fiction with some similarity in style whereas I think Allende’s early and later books are very different? And this is a good read … I’m picky because it’s not a WOW read but the characters and the story she tells are interesting, particularly for someone interested in the US. That’s such a good point about the voices – maybe if she’d given us Caleb’s voice he would have faded less as a character in the second half. He was so engaging and vivid at first. On the other hand, I wonder if Geraldine herself was less engaged with him and his situation at that point and wasn’t able to engage us? Or was she making some bleak point? Good questions bushmaid! I suspect she wasn’t less engaged with him but perhaps felt hampered by the fact that he was based on a real person while Bethia was totally invented? Wow, you’ve been having some major book synchronicity lately! I like the way you approached talking about the book. so many questions, so many what ifs? So many places where things went right and so many more places where things went wrong. I like that Brooks included an afterward addressing some of the concerns of the Wampanoag. It does display a sensitivity to the issues of a modern white woman writing about a dispossessed and vilified people from the past. It’s fascinating how that happens sometimes isn’t it? I agree re Brooks’ afterword. I like it when authors delving into historical areas do that. Adds a lot to the book (for me anyhow). And she clearly went about her research and writing in a sensitive way. She comes across as a delightful person. I like the fact that an Indian did actually graduate from Harvard in the 1670s. That means there were some enlightened people back then. The situation between the Puritans and the Indians did deteriorate after that, but apparently there were some enlightened forces at work before then. It is important to try and re-create the conditions that allowed an Indian at that time to attend and even graduate from Harvard. It certainly was a great achievement … but such a complex issue, this one of “crossing”! No need to apologise as this is the first of hers I’ve read since starting the blog. I think I’ve read all of her books to date … I liked both her non-fictions: Nine parts of desire, and Foreign correspondence. I enjoyed her first two novels: Year of wonders, and, particularly March. I thought People of the book was interesting but the contemporary thread didn’t work for me. The story of the book itself though was nicely done. Have you read any of hers?